Lucas Jae, independent group leader at the LMU Gene Center since 2016, has received Germany’s most important prize for junior scientists today! 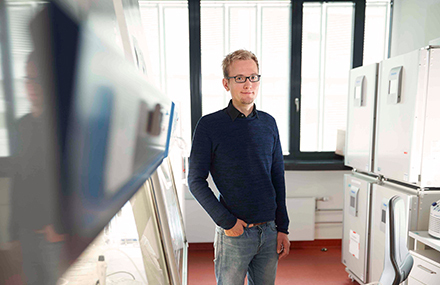 Lucas is an expert in functional genomics and developed genome mutagenesis and CRISPR/Cas genome editing methods to study the genetic basis of cellular processes important for human disease. Before joining the Gene Center in the end of 2016, he worked with Thijn Brummelkamp at the Netherlands Cancer Institute in Amsterdam. For more information about Lucas Jae's research projects, please visit the Jae lab website. Please find more information about the Heinz Maier-Leibnitz-Preis and about the 2018 prizewinners on the DFG website.